You are here: Home / Blog Post / Are school auctions harder to organize in public schools? I think so. In February I participated in a PTO (Parent Teacher Organization) expo in Chicago. Though I’ve participated in many trade shows when I worked at GE, I’d never participated in a trade show as part of my own company. I thought I’d give it a shot to see how it would go. The Chicago event is one of the largest PTO expos. Organizers mentioned that 600 or 700 people had registered. I was tucked in amidst a sea of traditional fundraising concepts: candy … bags … gift wrap … etc. No surprise that I was the only booth selling help for school auctions. I’ve also noticed that the larger the public school, the more likely that smaller fundraising factions will form, such as team-specific booster clubs. Sometimes those smaller groups might each run auctions, or perhaps pool resources to have a single auction and then divvy up the proceeds. At this event – which is geared towards public schools – I was surprised by the number of PRIVATE schools attending. When I reviewed the cards of those who visited my booth, the private school contacts greatly outweighed the public school contacts. The attendees (99% women) would swing by my booth. “Auctions!” they’d say, “Whatcha got?” I’d ask what group they represented, and inevitably it was a private school auction, and usually one affiliated with a Catholic or Lutheran church. In contrast, a friend affiliated with a public school auction in a wealthier zip code has a better organized and more successful event, though still not performing to potential. What does this mean? Why are (some) public schools not embracing auctions? Lack of volunteers: Volunteer support is harder to come by in public schools, and auctions take volunteers. Lots of ’em. 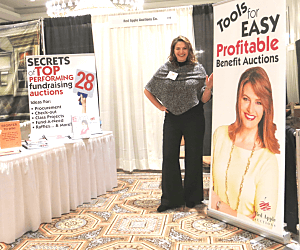 Complicated processes: Auctions take more sophistication to run than traditional “FILL IN THE BLANK” fundraisers. Raising money via an auction isn’t nearly as simple as saying, “Fill out this form with the number of candy bars you want.” Even understanding how to accept credit cards at an auction can stop some groups in their plans, which is why I hear of groups doing check and cash-only auctions. So imagine you have a handful of volunteers and each of you are stuck trying to get your head around 5 or 6 fairly complicated processes all by yourself. Ick. Lengthy lead times: Auctions take time to produce and understand, especially when the auction is a new concept to your school. If you’re trying to decide on a quick ‘easy money’ fundraiser, an auction shouldn’t be on your short list. A “no exclusions” mentality: There’s a strong undercurrent in public schools that “all parents must be included.” This usually leads to free or low-cost tickets which tends to work against the fundraising goal. A lack of structure. Every auction is designed by committee, but more so in public schools. In a private school, it’s not uncommon to have a Development Director (or Events Manager, or Marketing Support, or Admin, or a Priest) making some strategic decisions. If it comes down to THIS or THAT, the buck may stop with the school contact, who makes the deciding vote. In a public school — unless the school has an active foundation with a development contact — the buck doesn’t really stop with a person, but a committee. This lack of definitive leadership can make the process of planning an auction painfully slow. Are public school auctions popular in your area? Do they tend to be silent auctions only? How do they differ (if at all) from the private school auctions you might also attend? I’d love to hear your thoughts! Write your comment below. P.S. If you’re thinking about running your first auction, don’t do it without reading Easy First Auctions. I think what you are arguing here is true. What is missing is another big “why” and it comes down to money. Many times, private schools will have a specific budget amount that is dependent on fundraising. Without that amount being reached, the budget for the school is in question, and the easiest solution is tuition increases. For parents sending their child to that school, a tuition increase may prevent their child from attending. The need for the event to raise the stated goal of $100,000 is felt by the committee and the attendees, and there is a mindset of getting every dollar possible from the event. They bring in $90,000 and they are disappointed. Public schools, though, are not faced with these types of demands (not to discredit the severe lack of funding in public education). In the mindset of public school fundraising, any amount raised is appreciated, as that is bonus money. So the same event can raise $25,000, and organizers are ecstatic. The event doesn’t have to be flawless, it just has to be “good enough”. That in itself is actually a positive for organizers and takes off major pressure to reach a specific goal. Excellent points, Gary. I hadn’t thought of that, but you’re right. Most of us — when we feel pressure to perform — will “up” our game and perform at a higher level we didn’t even know we could achieve. And if the pressure or goal is low, our mindset is different. Most of our customers (about 70%) are school auction teams, and we do have a large number of public schools that run full gala auctions, with live & silent auctions, plus wine walls, raffles, etc. 3) Public school PTAs are far more prone than private schools to having to take a year off due to not being able to find enough volunteers. That said, we do talk every day to public school PTAs that are making auctions work for them, so no one reading this should be discouraged. Just listen to Sherry, and it will all turn out okay. Roger, I suspect you’ve got a point with your regional differences. For instance, on observation #2, rather than a full-blown auction, I tend to see bucket raffles (usually in conjunction with a school-wide event, such as a carnival) offered along the East Coast. A bucket raffle requires fewer volunteers, which may also blend into your observation #3. Always nice to hear from you. Thanks for sharing!